For more than three decades, Peter Vermes has been prominent in American soccer. He played collegiately at Rutgers before embarking on a career that took him overseas to Hungary, the Netherlands and Spain as well as the MetroStars, Rapids, and Kansas City Wizards. He represented the U.S. at the 1988 Olympics and 1990 World Cup, earning 66 caps and scoring 11 international goals. He is the only man in league history to win an MLS Cup title as a player (2000) and head coach (2013) with the same team. 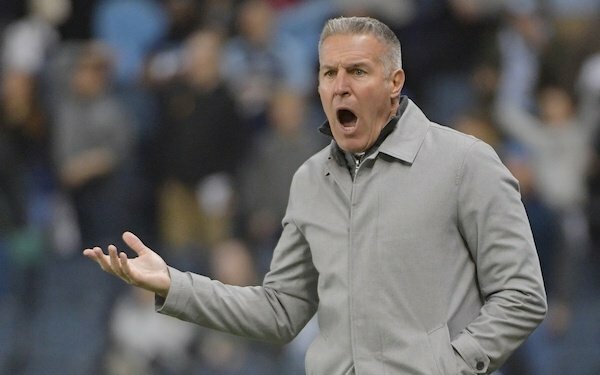 Vermes, 51, has served on the U.S. Soccer board of directors as Athletes’ Council chair, was the soccer representative for the U.S. Olympic Committee, and has also been on the board of the U.S. Soccer Foundation. He retired in 2002 and has been manager/technical director of Sporting Kansas City since 2009. Under his watch, SKC has won three U.S. Open Cup titles (2012, 2015, 2017) as well as an MLS Cup. SOCCER AMERICA: You recently discussed with U.S. Soccer its openings for a general manager and head coach, and decided instead to extend your contract with SKC until 2023. During those discussions with USSF what did you learn or glean regarding what it intends to do in the future? PETER VERMES: I wish I could. I don’t know. I don’t have any idea of what those steps are. SA: So how can a search be conducted if the federation doesn’t seem to know what it is looking for or what it wants to do? VERMES: Honestly, it’s hard for me to answer that question. I’m really serious. They want a coach and a GM but I don’t know what their plans are beyond that. I really don’t know. SA: What do you think should be done? VERMES: I truly want us to take advantage. We can talk about what happened but to me it’s irrelevant at this point. I want to see what the plan is going forward. If our only objective is to qualify for the World Cup, I don’t even know why we’re in this. We should be doing so much more. We need to create a complete system from the grassroots up, and I think the responsibility for the leadership should be U.S. Soccer. We have to be much more specific about who we are and what our model of play is, what our culture is when you go to the national team. I look at it as a gift. There are moments in life when you’re given a chance to hit the reset button and this is one of those moments. SA: How does that process start? VERMES: I don’t know the answer because I’m not there. What I want to hear and you want to hear and we all want to hear is, what is the plan? What are we doing? I would agree that you don’t have to blow the whole thing up and start all over again. But you do have to realize there have been some major failures and you have to evaluate it and come up with a plan. And to come up with a plan you have to have a goal. I want to know what the goal is. The goal has to be something more than to qualify for the World Cup. There’s different goals. I’m a big believer in that to build a team you need a model of play. In all sports, all teams want to win. Why do some teams win? They have a way to play and they use certain players and build their team in a certain way. There’s a reason they are consistently competitive. If you don’t have a way to play, I’m gonna tell you the only way you’ll get results is because you were lucky that day everybody was on form. But when you know how to play, results are a byproduct of knowing what you’re doing, what your model of play is. We need to get to place where we have a plan on the field, a plan off the field, a plan for recruiting players, a plan for identifying players. I just want to hear what the goals are and what’s the plan to reach those goals. 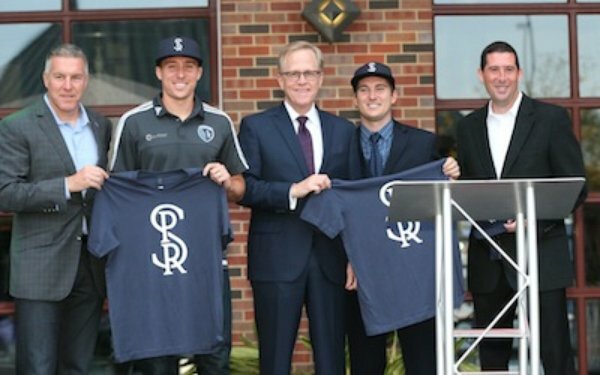 SA: Is this the method by which you and the ownership group at Sporting Kansas City has established one of the top franchises in MLS? You started with the team as a player in 2000, were hired as technical director in 2006, and have been head coach/technical director since 2009. VERMES: We’ve qualified for the playoffs the last seven years in a row. In this league, to be that consistently competitive – with all the factors of teams changing staff and players and salary-cap issues and all that – year after year and win trophies along the way, I think is a huge testament to the organization. At the same time, I’m fortunate that I’ve been here since the beginning. I’ve been a participant in terms of the building of the club. It’s one thing to add the academy and the USL team and the staff to support those entities as well. All of those things have been part of the project. Being on the ground floor has helped immensely. I know what’s been needed from a staffing perspective, I know what we’ve needed from an investment point of view, and so I think I’ve been able to hire a lot of really good staff and give them the confidence and the autonomy to go about their jobs. At the same time, we’ve kept a really good communication line between each of those three entities, which is probably the most important thing. There’s not an academy staff, a USL staff, and then my staff. We just have a staff. Everybody’s connected in that regard. We take steps to make sure we are very well-informed of what’s coming down the pike, but also what’s going on on a daily basis. That has been a real important aspect of our growth and also the ability for us to get better at what we do. SA: How is the team organized? What are you in charge of specifically? VERMES: Our club has a delineation right down the middle. We have the business side and Jake Reid is our president and CEO. Then there’s the technical side and I’m basically the president and CEO here. I report directly to ownership. I don’t report to anyone on the business side or a GM or anything like that. So I make all the decisions on the soccer side. When it comes to scouting, nutrition, sports performance, all of that stuff, those departments report to me. Having been able to grow all this stuff from ground zero I’m very well-connected to each piece of that. I know what’s been needed from a staffing perspective, I know what we’ve needed from an investment point of view, and so I think I’ve been able to hire a lot of really good staff and give them the confidence and the autonomy to go about their jobs. SA: With the addition of the academy teams and USL operations and expansion of staffs for scouting and sports performance the past few years, MLS head coaches have a lot more on their plates than just the first team. How do you and your staff juggle all of those plates at the same time? VERMES: I think I’ve hired a lot of really good people. Not to say we didn’t have good people before, but we had to keep building our staff. We’re hiring people who have a very good understanding of the objectives for each of our departments and what we’re trying to achieve. We meet regularly and they are formal meetings. It’s not just, ‘Hey, howya doing? What’s going on? Is that kid any good?’ There’s real discussion on a consistent basis. You have to be well-organized to keep tabs on everything. The days of showing up at 9:30 for a 10 o’clock training session and go out to set up the field and train until 11:30 and go home at one … those days are over. SA: If it’s not a game day and the team isn’t traveling, what is your daily schedule? VERMES: I get in about six o’clock in the morning and leave about five or six. SA: That’s a full day. VERMES: I agree with you that things have really changed in the last four or five years. Before it was every three or four years the league took a step up. Now it’s every year the league is taking another step. To keep up with that not easy. SA: Since winning the MLS Cup title in 2013, SKC has been eliminated in the Knockout Round four straight years. When you look back on those games is there any common theme that you have been addressing either in terms of player acquisitions or other factors? VERMES: All four of those years we had to play that game away from home. That was definitely a common theme, but I’m one who looks for trends, so I can point to that and one other thing: Last year, I honestly felt we didn’t deserve to go through. On that day Houston were better than us. They deserved to win the game. But in the other three years, I thought -- and I really mean this – we deserved to get through because in the games we were better. One was Portland on penalty kicks , we all remember that thing, but I don’t see any other trend except for it’s the Knockout Round and we’re away from home. SA: MLS teams are able to spend a lot more money on players, which ramps up the importance of scouting and player identification. How much do you and your staff utilize foreign scouts and related services? VERMES: It’s always going to come down to the philosophy of the club. First off, when you say you’re looking for a No. 9, are you looking for a tall, big target forward, or is it a small, nimble, mobile No. 9? What are you looking for? Knowing the positional characteristics is obviously step one. What is your model of play and what are your positional characteristics for each position on the field? That is paramount. At the same time, you also have to make sure you’ve been educating the people and you have really close contact with those people who are doing the scouting. They must have a really good understanding of your model of play and what are those roles and responsibilities for those players, and judge the ability of the players they are scouting for those positions. That takes time to develop and evolve your staff around that. It’s the last bastion because you can’t just say, ‘Okay, tomorrow we’re going to hire 15 scouts, let’s go,’ because it doesn’t work that way. You have to train those people, you have to get them indoctrinated into your culture. A lot of the time they’re not in your organization every day; they’re traveling a lot or their living in a different country, so you have to come up with ways to get them into your environment so they can see it and understand it. Then you go from there. SA: How much do you use metrics? VERMES: There definitely are metrics we look at. You have to remember a couple of the difficulties. One is that soccer is worldwide and the platforms aren’t all the same. There’s only one National Football League in the world and they pick players from one main source, the colleges. They can measure and test every player all the same way, and compare the data. We have to extrapolate the information across different platforms to be able to determine Player A compared to Player B. That in itself is a lot of work. That’s why we only look at certain statistics or metrics on players. The other piece is that we always make sure if we’re going to do a signing of a foreign player, after we’ve done our video review and checked all the references, we spent at least a week in the player’s environment. We watch them train, we watch them play a game or games, we sit down and talk with them, their family, their agent. We spend a lot of time trying to find things you wouldn’t find watching a video on a computer. SA: Since there is a lot more money involved, each decision is that much more crucial. But you can also spend the time and resources to research the individual as well as the player. VERMES: That’s right. You can afford now to evaluate the technical, the tactical, the physical, the psychological and even the emotional elements, because you have more resources at your disposal. When you’re talking about spending the kind of money that is available at this time on players of higher quality, you want to make sure you make the right decision. You’re spending a lot of money. Guys like Felipe Gutierrez, Johnny Russell (photo), Yohan Croizet. We couldn’t have afforded them two or three years ago. With the injection of new resources – the cap and TAM and GAM and DTAM and everything else that’s out there – it allows us to go into a different stratosphere, a different tier of players that we can shop for. At the same time, players now want to come to MLS. You don’t have to try to convince them by overpaying. That has helped immensely as well. SA: Teams are also pumping a lot more money into their own programs of domestic player identification and development. Where does SKC and the league in general stand in that regard? VERMES: With the academies, I think the first five or six years really didn’t count. It’s in the last three or four years that teams have made significant investments and the DA has become a major help to all of that. All of that has improved the level of the competition in the development of players. I would also say is that I have to believe as much as there’s been an infusion of foreign players into our league, which is fine, I think in the next five years you’ll see an injection of players who’ve come through the pro pathways of MLS clubs into the first team. A large majority of them will be American kids and that’s pretty exciting. SA: So what role should the federation play in player development and forming competitive teams at different age levels? VERMES: Let me talk first about player development. That phrase is used so haphazardly because there’s all different ways to develop a player. There’s training on the field, there’s high-quality games, there’s evaluation and there are more opportunities than there has been. But what I would say is we need to increase the number of high-level coaches, and I don’t mean professional coaches, as in they had to coach at an MLS level. I mean really well-educated coaches at all the different levels of player progression. That is the place where we do not have a plethora of people. I know that U.S. Soccer has revised their education certifications and they’ve done a good job with that. That’s a big step in the right direction because we need better coaches in this country. That’s number one. I took the U.S. Soccer Pro License course -- I think it’s been two years ago now -- and I have to tell you I thought it was incredible. The people they brought in for the lectures were tremendous. It was a great program for me as a professional coach to go through. Now obviously if it was available earlier I’d have done it a long time ago, but the fact I had the ability to take it was tremendous. I think what they’ve done at each of the levels – the Pro, the A, the B, the C and the D and all the youth licenses and modules – is a great step towards pushing the envelope and making it a heck of a lot better than it used to be. SA: What should the coaches be coaching with the national teams? VERMES: The next piece is – you had asked me this a long time ago – should we play more like the Brazilians or the Germans or whatever, and I said, ‘No.’ I guess I’m getting kind of tired of listening to that because we do have our own style. The thing is we need to embrace it. It’s not hard to figure out who we are. We’ve always been a really, really fit team. We have an undying mentality and we can play as well as we want to, if we’re committed to playing the game in a certain way. We have to decide what our model of play is and then we have to embrace that and keep building upon that at the national team level. That has to be completely threaded through all of our national teams. You can’t have the senior team playing a 4-4-2 and have the U-14s playing a 3-5-2. It doesn’t make sense because if you’re truly going to be developing players, they have to be in an environment where they are being developed within a system that is consistent all the way through. They can have tweaks to that system along the way. We’ve never had that consistency in our national-team program. That has to happen. When that’s going to happen, I don’t know, but it has to happen at some point. There’s three things you have to have for a successful soccer program. You have to have players, staff and facilities. We’re building incredible facilities in this country. I think we have incredible players, very good players. The final piece is we have to increase the number of better coaches at all the different levels so that we challenge these kids at each age group, at each step along the pro path. SA: Speaking of facilities, you unveiled Pinnacle, your new training complex. That must have been a powerful reminder of how the team and the league have changed. VERMES: Oh yeah. If you had been here for the grand opening, you’d be absolutely blown away. There’s just no comparison to what it was like when I first came here as a player 18 years ago. I never expected it to be this way, but I remember being hired by this ownership group and having a vision we’d have something like this one day, and the fruition is here. I’m really proud of how the league has evolved. It’s become a real league in the world and we are starting to take some huge strides and, man, we’ve done it in such a short time. It’s great to see. 24 comments about "Peter Vermes asks of U.S. Soccer, 'What is the plan?'". R2 Dad, May 19, 2018 at 2 a.m.
Good interview. Even in this limited format I have a much better understanding of what this guy is all about. "They want a coach and a GM but I don’t know what their plans are beyond that. I really don’t know." This sounds like a big vote of no-confidence in USSF. "That has to be completely threaded through all of our national teams. You can’t have the senior team playing a 4-4-2 and have the U-14s playing a 3-5-2. It doesn’t make sense because if you’re truly going to be developing players, they have to be in an environment where they are being developed within a system that is consistent all the way through." This is exactly what Claudio Reyna wrote in his US Soccer Cirriculum paper, which every soccer coach in this country--because they all know better--feels free to ignore. Sounds like Vermes doesn't want any part of the USMNT because he wouldn't be set up to succeed. D'oh! Wallace Wade, May 19, 2018 at 9:17 a.m.
After reading this, I know my views on US Soccer Leadership are and have been spot on. A complete train wreck orchestrated by a very small group of people that are not qualified to organize and execute a plan to moving forward from the grassroots up. They might be excellent business people and bankers etc., but not even close to being reputable soccer minds. frank schoon, May 19, 2018 at 9:30 a.m. The interview was refreshing and it was good and finally someone has come up with the right direction on where to go with things. Vermes no doubt has looked into the kitchen when he played in Holland and learned some good aspects.... I'm still waiting for KLINSMAN to be allowed to speak his peace in SA. What Vermes states is right on the mark, and I can sum it up in one word, STYLE. We have no style, we play in a hodgepodge, mongrel manner. The closest description one can describe US soccer is that of opportunistic , counter attacking style, all of which takes very little brains to play. We have to choose whether we are going to play an offensive or a defensive style and of course it needs to fit our culture therefore, the former fits us better. The best system to play for an attacking style, would be a 3man front line, which means having wingers. Do we develop wingers, NO. Then you have to ask why not? ; why doesn't the DA program develop wingers. The answer is the DA program has NO PLAN it only works with the youth with no end result. Here is another problem with the DA program, they don't have a plan or focus as how we should develop our players....it's called HODGEPODGE player development. If you don't have a style to follow how can scouts operate in knowing what to look for. Wooden Ships replied, May 19, 2018 at 4:41 p.m.
Frank, for me it must be quick technical players, with imagination. There in lies the problem. Too many US youth players have grown up with the opposite. Those with the requisite skills have been excluded by the coaches and club machine. Too much overcoaching as well, Pavlovian result. We need the attacking-possession style, which means the vast majority of soccer people in our country, culture, have had it wrong for decades. Getting them untrenched will be a real challenge. The establishment is still living the falsehood of bigger, stronger, faster. Bob Ashpole replied, May 19, 2018 at 5:25 p.m. I agree and I hope most people would. Bigger, stronger, faster is good too, but not instead of skill and the smarts to use it. Virtually everyone agrees that techncial development comes first in development, but that development plan too often gets lost in the chase for meaningless youth match results. Your overcoaching point is key. You cannot teach someone to play well by telling them what to do. It gets worse with each generation. The harm is not just to elite players, but to all the others too who will be officials, coaches, and parents of the next generation. frank schoon replied, May 20, 2018 at 10:47 a.m. Ships, we think so much alike on this..There has to be mental change ,like you say, about bigger ,stronger ,faster. It's funny ,when you Xavi or an Iniesta play who are totally opposite of those 3 qualities. In order to play intelligent with smart ,technically savvy players , you also have play a style that obviates the crunching , the brute force, and fight. That means like you say ,possession ball. All of this requires total retraining of the mind and player development as how it's currently play. Bob Ashpole, May 19, 2018 at 9:35 a.m.
Great interview. USSF needs to reorganize with a CEO for soccer of equal status to the business side. The new plan has a Chief Soccer Officer, but title, but is in charge of no one and no area. He shares management responsibility for "topics" with 3 other technical managers. The plan is management by committee. Been there. Done that. Don't want to do it again. s fatschel, May 19, 2018 at 10:27 a.m.
Another useless interview on the question of youth development. Very sad that our top coaches can't articulate a plan. Bob Ashpole replied, May 19, 2018 at 2:31 p.m. There are plenty of coaches with plans, including Vermes. It is USSF that currently hasn't got a current plan. 7 years ago Renya introduced a USSF plan (the "coaching curriculum") for player development through age 18, but it vanished. I thought there were some problems in the earlier ages, but it was a start. Managing the soccer side is not the same as managing the business side. They are different areas of expertise. s fatschel replied, May 19, 2018 at 4:18 p.m. If they have a plan they can't or wont articulate it. Just buzzwords ad nauseum, street soccer, pay to play, pro /rel, licencing, without details of a plan to move forward. That includes the presidential candidates too. Bob Ashpole replied, May 19, 2018 at 5:39 p.m.
Those "buzzwords" are not empty phrases. They have meaning. The problem at USSF is not a lack of available plans, but rather a failure to execute its plans. Under Gulati, USSF had direction from Gulati. The new president, however, likes to manage by consensus with committees. That is not the leadership style I would pick for an organization that needs direction. As for detailed plans, I don't believe it is reasonable to expect one person to have his own detailed plans on every topic. That is something the person with the actual responsibility does. Generally speaking top level managers supervise people doing the actual planning. Plans are not the end objective. Plans are just tools used to manage people. People are what is important, and management's first step is putting the right people in charge and give them what they need to succeed. s fatschel replied, May 19, 2018 at 7:32 p.m.
Not exactly, USSF did act on it's plan to create the DA and that, a massive project. Now Vermes new idea/buzzword is we need well educated coaches. Brilliant. Every coach in our area, at the competitive level, has at least a D, C or europe equivalent and has played high level soccer. So if he wants every coach to get a A,B then suggest a plan for USSF to come to every city in the US and provide free courses. Also remember most parents/players don't care about USMNT. They care about their being happy and soccer maybe helping towards college. Bob Ashpole replied, May 19, 2018 at 10:19 p.m. Some would say that the DA is a perfect example of a failed execution. s fatschel replied, May 19, 2018 at 10:53 p.m. Rational thought would say thats nonsense. Consider all the positives in the DA. More often than not those "some" have an axe to grind. Kid didn't make the DA or bitter old coach lost a player or coaching opportunity. Bob Ashpole replied, May 20, 2018 at 12:30 a.m. In 10 years they have not only failed to produce "world class" players, but they haven't even produced a U23 team that can qualify for the Olympics. Our men's program progress has been going downhill instead of improving. s fatschel replied, May 20, 2018 at 9:14 a.m.
Keep reading DA website under benefits or just review previous SA posts. Vast majority DA players heading to college because a short soccer career in USL followed by coaching is not attractive. Rational minds understand producing world class players takes time and many other factors are involved. Rather than complain suggest a better plan or improve the one we have. Bob Ashpole replied, May 20, 2018 at 3:21 p.m.
You haven't seen my posts advocating the German break out training model for the best teen players not in a professional academy? The German FA employed 500 full time professional coaches dedicated to identifying, training and evaluating the best male teen players. No club coaches involved so not conflicts. No special teams so no competing with clubs for players and no team training. No interference with club programs. Just 100% focused on player development. Building on what the clubs do, not building a parrellel system to compete with them. s fatschel replied, May 20, 2018 at 5:30 p.m.
That's a good idea and something that comes out of improving ODP or us training centers. Someone will need to pay 500 coaches. But I can tell you from spending a lot of time in Germany it's a system in addition to a very mature club system that every city or village has at low cost. The DA is still trying to fix a broken club system that a generation of clubs prior to 10 years ago failed us with the pay to play and tournament model and got soccer rankings. It's doesn't change the need for DA. s fatschel replied, May 20, 2018 at 10:06 p.m. The program is listed on the DFB website. It meets once per week for ages 11-14 and is in addition to club training. Bob Ashpole replied, May 20, 2018 at 10:42 p.m.
USSF uses club coaches to run the program and the temptation is for the club coaches to use the regional training centers to promote their own players and clubs. Also the training centers are not local like in Germany reducing the wasted time and expense to travel. These differences are critical to success. s fatschel replied, May 21, 2018 at 7:57 a.m.
ODP is local and is run by a DOC who is not affiliated with any club. If in your area you have un-ethical coaches they should be reported to the DOC. We don't have that issue. Our system is not so bad and just needs support and improvement. Don't loose to much sleep over the USMNT. It's small group of players and better to focus on lower levels. It's going to take a long time until the USA is at the level of Germany or other nations for other reasons. Ginger Peeler, May 19, 2018 at 11:15 a.m. Right, Bob. We may be approaching the Peter Principle”...the employees have been promoted to the level of their incompetence. I fervently hope that’s not the case, but, until somebody has a “plan”, as Vermes mentioned, nobody knows. Kevin Leahy, May 19, 2018 at 2:34 p.m. It is very disheartening to realize that nothing has changed @ the Federation. Could careless what Klinsmann has to say. He needs a reality check on what he created. Having a consistent program with anything is important. Makes me believe this Federation will never get it right. humble 1, May 21, 2018 at 11:33 a.m.
Good interview, I only wish the intereview would have delved into the reasoning behind the following, which if it comes to pass will validate a lot of the work the USSF has done which Vermes seems to feel is incomplete. "I would also say is that I have to believe as much as there’s been an infusion of foreign players into our league, which is fine, I think in the next five years you’ll see an injection of players who’ve come through the pro pathways of MLS clubs into the first team. A large majority of them will be American kids and that’s pretty exciting."